This article is also published at FantasyPros.com. 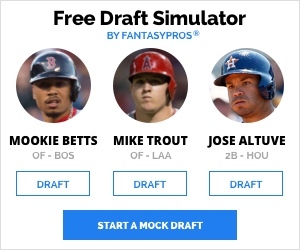 Check out FantasyPros MLB Draft Simulator for help with your upcoming MLB Draft! You can follow Ryan on Twitter, @RyNoonan. In part one, I took a look at the top-40 overall from both FantasyPros and Steamer. Today I’m going to look at the players in the 40-85 range for each group and see if we can find any market inefficiencies. Here’s a quick overview of the process if you case you missed part one. (Shame on you.) It’s important to note that you’ll see subtle changes to the ECR as the weeks go on. More experts will import their rankings, and speaking for myself, I tweak mine often. Here’s a look at a couple of different tools that I find helpful in uncovering value in fantasy drafts. I’m going to merge these tools together and see what we find. The first one is FantasyPros.com and their Expert Consensus Rankings (ECR). If you aren’t using FantasyPros regularly, then I don’t know what to tell you. You’re at a disadvantage in my opinion with the ECR in particular being a great resource in February and March. 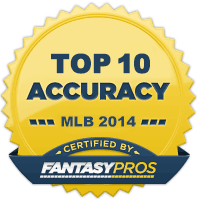 It’s a one stop shop ranking platform with the best names in the fantasy industry. The rankings for each position along with a full player pool ranking are available all in one place, and you can customize it as well. A successful draft is one where you can extrapolate the most value from each pick. Using projections and formulating your rankings are important, but understanding things like ECR and ADP (average draft position) are vital on draft day because your league-mates are using them. ECR helps you get the most value out of each pick. Secondly, I want to look at the projections from Steamer. There are a number of well respected projections out there, but for this exercise we’ll use Steamer. Recently, Zach Sanders from Fangraphs took the 2015 Steamer projections and used z-score to create a fantasy value above replacement, or FVARz. Zach’s work allows us to look at the overall value of each player, and essentially creates a Steamer ranking and auction value. I’ll start with the pitchers as I did in the last post. I’m going through this slowly so I’m able to break it down for you, but having looked at the player pool as a whole it’s easy to see that pitchers are featured prominently in the ‘pro-Steamer’ side of the debate. Keep that in mind. It gives us a good look at the actual value that’s returned from a strong pitcher, as is the case with Jon Lester. Steamer projects a slight dip across the board for the Northside’s new ace and yet he still comes in a full round ahead of his expert ranking. Early reports on Matt Harvey are extremely positive, but I won’t be able to rank him with confidence until we get to spring training. Even then I’m sure we’ll have plenty of questions. Steamer has little doubt that he’ll return to his top of the rotation form once healthy. Hyun-Jin Ryu has 344 innings of being a sub-3.00 FIP pitcher under his belt. That’s worth your attention. Last season’s 2.62 FIP and an elite K-BB% of 17.4 has Steamer bullish on a strong 2015 from the Dodgers left-hander. He’s a great value for those looking to attack the starting pitcher pool after round 10. 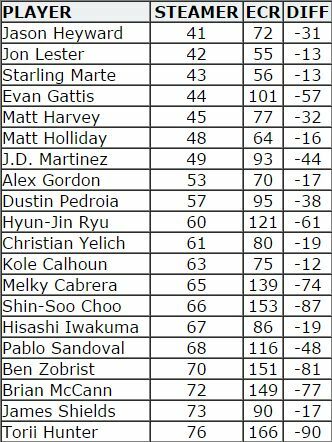 2014’s Hisashi Iwakuma was the same as 2013’s with the exception of the extraordinary batted ball luck. Projecting a repeat of 2014 feels fairly safe here. The last ‘big name’ free-agent signed over the weekend as James Shields signed a 4-year deal with the Padres. I don’t have to explain why that’s good news for his fantasy prospects for 2015. Giddy up. Jason Heyward is still just 25. There is plenty of time for this kid to deliver on what in hind sight appears to be unrealistic expectations. Steamer’s calling for a return to his 20 home run output from years past. Evan Gattis gave the Braves a fairly useful 108 games last season, mostly behind the plate. His move to the American League should help increase his plate appearances and thus, his counting stats. You’ve got to love catcher-eligible players that don’t catch. Steamer is calling for 136 games played and 28 home runs from Gattis. J.D. Martinez changed his swing last offseason, and became a new player. That player isn’t one that we can expect to hit for average again. I’m buying the power here but a BABIP more in line with his career numbers makes him a .270 hitter, not a .315 one like we saw in 2014. I can’t write rationally about Dustin Pedroia, so I’ll just note that he suffered a power-sapping wrist injury on opening day. I won’t make a case for him as a top tier second baseman again, but hitting atop a much improved Red Sox lineup, I think he’s a value at 95 according to the ECR. Christian Yelich is an intriguing player heading into 2015. 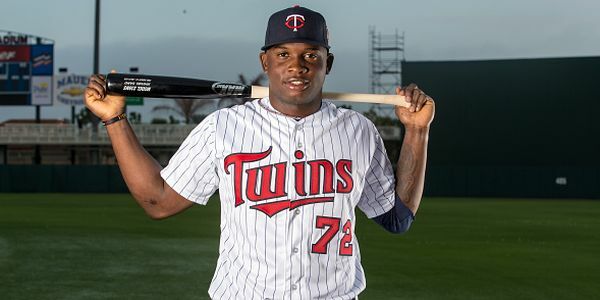 The 23-year old pounded the ball into the ground last season, a 61% ground ball rate, yet had an impressive batted ball distance on fly balls and home runs that ranked ahead of power hitters like Edwin Encarnacion and Chris Carter. Even a slight improvement could make Yelich a 20/20 candidate. 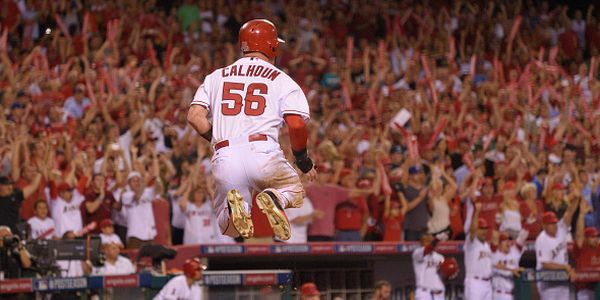 I owned Kole Calhoun everywhere last season, and at his current price tag I likely will again in 2015. Hitting ahead of Mike Trout doesn’t hurt, plus Calhoun offers across the board production along with elite upside if he can stay on the field for a full season. He showed better strike zone command coming up than he displayed last season, and he has double-digit stolen base potential as well. I find both rankings of Melky Cabrera to be a bit puzzling, but Cabrera was good last season. 125 wRC+ kind of good. He’s now on Chicago’s south side and fits nicely in the 2-hole ahead of Jose Abreu. Melky’s HR/FB ratio was a bit high compared to his career numbers, so expect a dip despite staying in a home run friendly environment, but this is a top 100 player who’ll help you in each standard scoring category. Steamer is very forgiving of Shin-Soo Choo‘s 2014 campaign. Personally, I’m a bit nervous that his contact woes are real, and that his BB/K rate is going the wrong way. The 32-year old outfielder underwent ankle surgery this offseason and could be a nice value at his current ECR slot if he’s all systems go come spring time. Josh Shepardson took an in-depth look at Brian McCann a few weeks back, which I suggest you check out. Pablo Sandoval is coming off back to back strong seasons, with a wRC+ north of 111 in each season. Now that’s not elite, but neither is the price tag. He’s moving to a much friendlier environment for hitters and his batted ball profile appears to be a great fit in Fenway. With a plethora of questions atop the heap at third base, I’m picking up what Steamer is putting down here. When I looked at the top-40 last week, I found zero pitchers in this group, but that makes sense when we think about the draft strategy applied by many in the industry. Johnny Cueto had a spectacular season, but one that’s due for some serious regression. His .238 BABIP-against was 40 points lower than his career number, and his strand rate was one of the highest in the league. There were some encouraging signs, like the jump in strikeouts, but don’t pay full price for his career year. I don’t think I’ll own many shares of Jordan Zimmermann in 2015, but that’s more a reflection of his price tag more than what I think of the player. His ERA and FIP were nearly identical last season, and while his xFIP indicates a bit of fly ball luck, his K/BB ratio jumped in to the upper tier in baseball. Walks were never a big problem for Zimmermann, but his strikeout totals had left a lot to be desired. 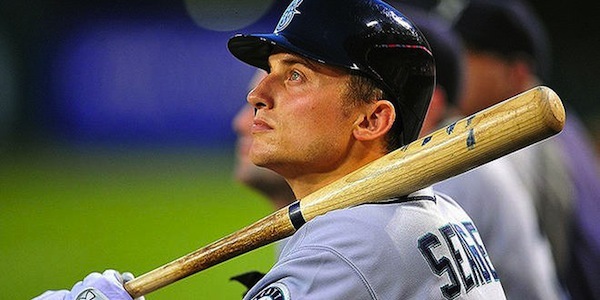 That was not the case last season as Zimmermann set a career high with a SwStr% of 10.3. The experts are still buying the name value of Adam Wainwright, but Steamer is calling bull$! *# on his 2.38 ERA from last season. It’s hard not to figure out why when you dig in a bit. Perhaps the elbow issues are behind him now after late October surgery, but I’ll let someone else find out for a sixth round pick. Julio Teheran really out-pitched his peripherals all season long in 2014. I was waiting for the other shoe to drop and it never really did. He doesn’t blow you away anywhere; his strikeout numbers are average, walks get him in trouble, and he carries a higher than average strand rate. Yet he’s coming off of back to back seasons that saw his ERA outshine his FIP. Is this who his? Is he the anti-Ricky Nolasco? The Shark is back in Chicago, this time on the south side playing for the team he grew up rooting for. Adorable, right? Jeff Samardzija will not have an ERA south of 3.00 this season. I feel extremely confident in that. In fact, I think it hovers around 4.00 for most of the season. I like the improved command, and he was able to induce more ground balls than ever before, but the fly balls that died in Oakland’s spacious confines will be souvenirs in Chicago. If you’re in the ‘wait on pitching’ camp, then Alex Cobb is your guy. He has elite, top of the rotation stuff, not just for the Rays but for your fantasy team as well. He was derailed by an oblique strain early last season, keeping his innings in check, and we’re seeing the impact of that in his Steamer projection. He changed his pitch mix a bit in the second half and it yielded an ERA of 1.79 and a wOBA of .255. Yes, please. My guys here at the Fix have recently touted the top two hitters here. Check out Shepardson’s take on Corey Dickerson (love him), and pass Brett Talley a towel to clean up the drool that accumulated while he wrote up George Springer. Matt Kemp put together a strong, balanced 2014 and he finished the season with a wRC+ of 140. The days of 30+ steals are gone and not coming back due to the lingering and repetitious leg injuries he’s endured over the past few seasons. Don’t let the move to San Diego scare you away from a power perspective, Los Angeles isn’t a hitter’s haven either, and his batted ball distance indicates he can do it again. The most passionate Todd Frazier truthers out there think Steamer missed the boat on Todd Frazier. Are we likely to see a near 30/20 repeat? It’s highly unlikely, yes, but Frazier needs to be selected in the top 100 picks of any fantasy draft in 2015. Last spring his manager Bryan Price said that he wanted to run more, and he wasn’t just talking about Billy Hamilton. The Reds were more aggressive on the base paths and Frazier was a large part of the positive results. He’s shown the ability to hit for power as well, with consecutive 19 home run season’s prior to last seasons jump to 29. He’s more 22/15 than 30/20, but that’s still incredibly valuable. Next on the list is a pair of consensus top-20 picks over the past few seasons, Prince Fielder and Evan Longoria. The roles were slightly reversed in 2014, as the oft-injured Longoria stayed off of the disabled list while Prince Fielder made his first trip to the DL, and it was a long one, playing in just 42 games in 2014. These former all-stars deserve more than a quick blurb, so I’ll circle back with them both later this preseason. Steamer produces raw data that’s not fully taking into consideration things like positional scarcity. As a whole, I feel positional scarcity is slightly overplayed and should be roughly 0% of your draft strategy in the first half of your draft, but I digress. 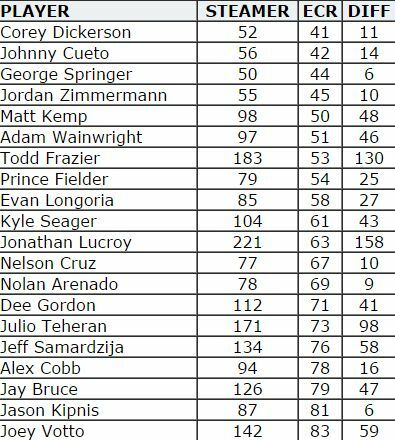 With that said, Jonathan Lucroy is an outlier here. He’s elite behind the dish and his glove at first base is solid and good enough to keep his bat in the lineup on days when he’s not catching. Got to love that. I love Nolan Arenado. Not as a man, but as a baseball player. He’s Lasershow II, and his second half plate discipline is extremely encouraging. Pay up. I wrote about Jay Bruce last season, and looking back at his final line, it was just more of the same. Bruce’s inability to drive the ball was also the issue for former first round pick Joey Votto. I’m surprised to see Votto’s ECR in the 80’s, given his track record, but he’s not the Votto we’ve grown accustom to. He needs his lower half to be health in order to drive the ball, something he’s never done enough according to his critics. He’ll be someone to keep an eye on and he’ll be a rare case because his spring stats will matter.